Rental Business Hub: Over 1.2 million people a month search for bike rentals in the U.S.
…Did you know that over 1.2 million people search for bike rentals alone on Google? In a closer analysis, Google Insights shows a 17% increase from 2010 to 2011, and forecasts an even larger growth spurt for 2012. The numbers indicate that shoppers are actively searching for bike rentals online, meaning there is a huge opportunity for bicycle stores across the country. Today’s consumer is not only searching for your products online, but they are looking to book online. When they’re hungry, they make reservations online through OpenTable. When they want to take a trip, they book on Expedia, Kayak, Hipmunk and a host of other online travel portals. When a customer reserves a table at a restaurant on OpenTable, they make their reservation online and expect the table to be ready upon arrival. Why should consumers expect less from your bike rental business? What are you doing for your business to convert that online traffic into online revenue? With Velolet, bike shops can be provide the customer service they have come to expect from travel sites and sites like Open Table It takes no time at all to get you up and listed and providing the services that 1.2M people look for when trying to rent a bike. In Bicycle Retailer and Industry’s Year in Review they report that for 2011, “Retailers see drop-off in rental business as bike share programs take off in major U.S. cities” Probably pretty frustrating for the Bike Shop we’re guessing! So, what to do? Well, get in front of these bike share programs by exposing your bike fleet to the travelers/cycling community BEFORE they arrive at their destinations by listing on Velolet. Bike Share programs exist and they are a great way to allow travelers to see the city… but they don’t necessarily fit the bill for everyone. What if you could make arrangements prior to taking off for you destination and get a ride that better suits your cycling passion from reputable bike shops that can really offer you something guaranteed to be there and something you would want to ride. Perfect example, events like SXSW make bike shops and Velolet a strong alternative to the bike share programs. Prior to your trip, you book your flight, hotel AND BIKE with Mellow Johnnys. When you get there, you aren’t hoping to grab a bike-share bike, your week long bike reservation is there and waiting for you when you arrive. Velolet makes it easy for the travelers to search a centralized and standardized platform for just the bike they need for the ride they want to do in their size. Then let the travelers sign waivers electronically and make the reservation and payment so when they arrive, the bike is prepped and ready. So You Think Bike Rentals Are Only For Summer? Well our newest addition to Velolet, Golden Bike Shop (Golden, CO) would maybe disagree. 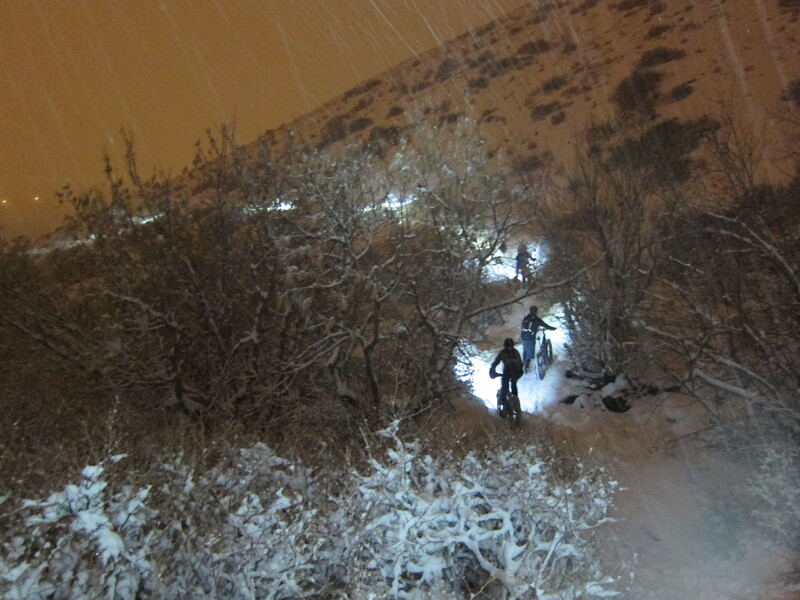 These guys took their newest Salsa Mukluks out on the 16″ of fresh snow they received last week. 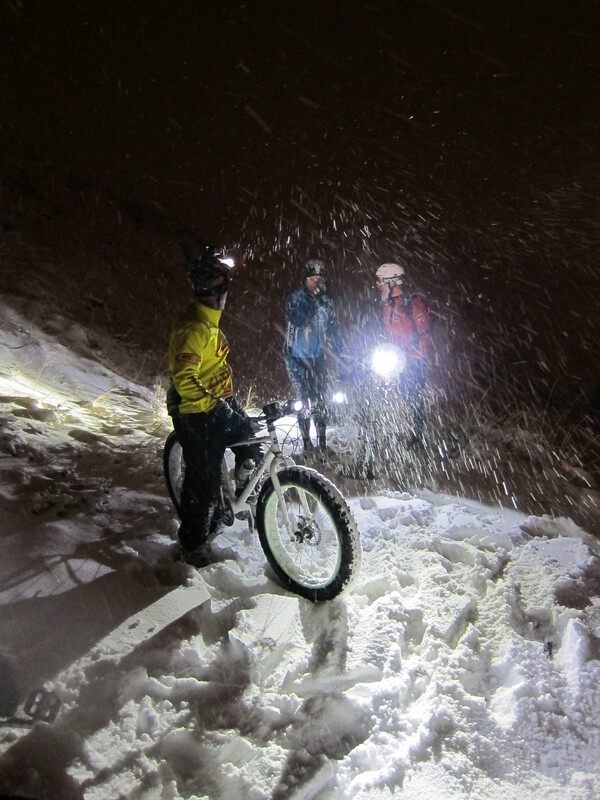 GBS’ owner, Greg Floyd sent us some great photos and we’re happy to display just how much fun these Fat Bikes can be. So, if you’re headed out to Golden/Denver area to play in the powder, consider a diversion from the normal double and single plank fun and rent a Fat Tire Salsa Mukluk for a few days. You’ll be hopping from place to place, smiling all the way. Brendan Mulligan at Techcrunch recently wrote about reducing friction for things like car rental and lodging. It also applies to bike rentals, and we don’t mean adjusting the brakes or greasing the bearings. No what Brendan is referring to is the friction involved in selling a product or service. The more you reduce the friction for your customer, the better experience he/she has and that’s important. Using the format Brendan used, he shows us an example of a hailing a cab vs. using Uber. The complete hassle and friction is reduced significantly in the Uber model. Much like Uber, Velolet reduces friction for its bike rental customers versus your normal in-store bike rental process. Find a Bike: Search online in countless Google, Bing or Yahoo searches, drill down to the bike shops listed, search their site for anything that says bike rental and if there are no rentals, start the process over again. Pay and Waivers: When you arrive, fill out a waiver with all your details, provide a credit card for processing. In store pickup: Wait until you arrive at the destination and hope your they have a bike in your size. Wait sometimes up to 30min for them to “prep” your bicycle so and make adjustments so you can get your rental. Find a Bike: Open Velolet website and search for bikes at your destination city. Filter your results to your size and put in your dates/time for pickup and drop off. Bike are presented (many times with pictures) and you select one and proceed to payment with a single click. Make Payment and process waiver: Secure reservation with credit card for EXACT bike and click online waiver. Between the two processes, the old method can take significant time and effort (friction) and in the end, doesn’t really secure a reservation for anything. With Velolet, your reservation, waivers, payment and EXACT bike are secured. The bike shop also is given a heads up ahead of time so the bike is prepped and presented and they don’t have to handle any paperwork either. Both parties (bike renter and bike owner) have just experienced a “frictionless” experience for bike rentals. So, if you’re a bike shop and want to reduce the friction for your customers, come on over to Velolet and let us put a little grease on the bike rental process. Your employees will be happy and for certain, your customers will too. A few months ago I was asked to get involved in a fantastic group called Full Cycle. Full Cycle is a nonprofit bicycle shop in south Minneapolis that offers a six-month, paid internship program for homeless youth. They employ, train and support homeless youth, teaching them bike repair and hands-on business skills including resume writing, interviewing skills, sales, customer service and overall professionalism. I couldn’t be more pleased to volunteer and offer assistance to this fantastic organization. Please take a few minutes to watch this great video and if you are interested in volunteering or helping out in some way, please let me know.